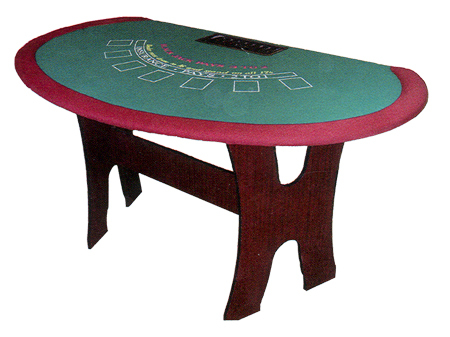 Hand-crafted from top quality materials, these Folding Blackjack Tables are ideal for club or home use. You can choose from three styles of Collapsible Blackjack Tables, including our Full Size/Seven-Player Folding Blackjack Table with Wooden Legs and our Blackjack Table with Folding Metal Legs. For additional information on any of our Folding Blackjack Tables, please feel free to contact us at 1-800-233-0828. You might also be interested in our Stationary Blackjack Tables and our complete selection of Blackjack Supplies.